Seventy-four-year-old Elfriede Dumont invites me into her back garden. Small and neat, there are little fir trees dotted around the lawn, tubs of flowers on the terrace and rows of firewood stacked neatly by the fence. There used to be a rabbit hutch, too, at the end of the garden. But not any more. "One morning, when I came out to feed my rabbits, I was surprised to see that the hutch door was open," recalls Elfriede. "I looked inside and saw Rocco just lying there. His head was missing. A little later I found Felina in the bushes. She'd been killed, too. I just cannot understand why." Rocco and Felina are among the 30 pet rabbits killed in the towns of Witten and Dortmund since last summer. Many of the rabbits have been decapitated and the blood drained from their bodies. It is one of the most shocking cases of animal cruelty that Germans can remember. 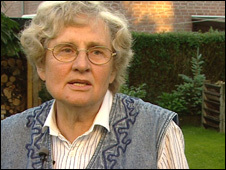 "I would never expect something to happen here," says Elfriede's granddaughter, Sabrina. "This place is so quiet. You can leave your car open and everything's fine. Yet there are people who murder rabbits!" Sabrina tells me about another incident. She says dead rabbits were discovered in the sandpit of a local school. "The rabbits were there without any heads and the children found them in the morning while playing in the playground. That's even more horrible than finding them in your own garden." Down at the police station, officer Volker Schuette shows me disturbing photographs of headless pet rabbits. A gruesome pattern is emerging. "It's always the same," Officer Schuette explains. "Detectives find the rabbit lying dead in a hutch. An unknown person has cut off the head and drained off the blood in a box or a bottle. So we find no blood and no head." 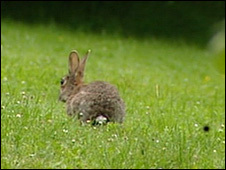 Police fear the attacker could switch from killing rabbits to killing people. They have set up a special task force to try to track down the killer. 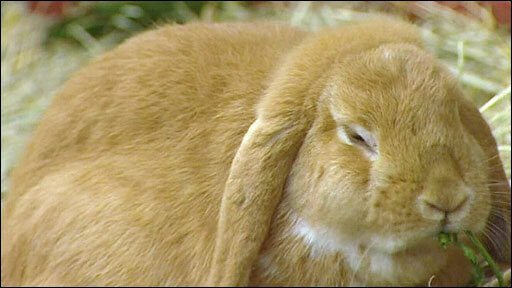 They are examining rabbit torsos for possible traces of DNA and they have questioned 300 people. But police admit they still have no idea who is decapitating the rabbits and why. It is also unclear how the killer has been locating his victims. On the edge of Witten, rabbit owner Julia Perkun unlocks her new rabbit pen. She has installed so many locks and latches, it is like a Fort Knox for rabbits. Inside the enclosure, Julia introduces me to her 13 rabbits which are scurrying across the straw and nibbling at their vegetable breakfast. Among them are fluffy white Reebok, and Samson, who has big brown ears right down to the ground. Julia says she chose this remote spot in a forest to keep her rabbits, so that they would be well hidden from the rabbit killer. She asks me not to reveal the exact location. "This place isn't visible from the street," says Julia, "and I try not to tell anyone where this place is. People know that I have rabbits, but I don't tell anyone where this place is, so I hope my rabbits are safe." Fear is driving German rabbit-owners to hide their pets away in the woods, like Julia, or in their garages, or in cellars. The pet rabbits of the Ruhr Valley are being forced to go to ground, while the killer is still at large.